By Steve Cox, Senior Technical Staff, Fluid Components International (FCI). Reprinted with permission. At one of the city’s water treatment plants, the chlorinator system’s flow measurement lacked suitable turndown capability (measuring range) and was not repeatable at lower flow rates and monthly totalized chlorine usage were not consistent (Figure 1). This poor control over the amount of chlorine being dispensed resulted in either excessive, wasteful chlorine use, or potentially hazardous and expensive re-treatment. Adding too much chlorine affects water taste (swimming pool), wastes expensive chlorine gas and adds the cost of extra residual chlorine removal. With too little chlorine added, the disinfection treatment process is incomplete, and the water requires costly additional alternative treatment or re-treatment. The city’s system had been initially designed with simple site-gauge rotameters. Later, for automated control purposes, differential pressure (dP) type orifice plate ow meters were added into the system. The city’s engineers soon discovered the orifice plate dP meters could not be relied upon to measure accurately under ow conditions where little pressure differential was available, and the limited ow range could not support the changing dose rates with changes in water demand. The treatment plant needed a better gas flow meter solution that would be appropriate for service in a 1-inch diameter pipe at a flow rate of 150 lb/day to 2,000 lb/day [68 kg/day to 907 kg/day]. The operating temperature was 60°F to 100°F [16°C to 38°C] at a pressure of 0 psig to 10 psig [0 bar(g) to 0.7 bar(g)]. The flow meter would be used to measure chlorine and no other gases and would be installed in a location where inadequate straight-pipe run was present and added to the accuracy challenge for any velocity based instrument. The flow velocities also resulted in measurement required in the transitional zone where the gas flow profile was transitioning from laminar to turbulent. 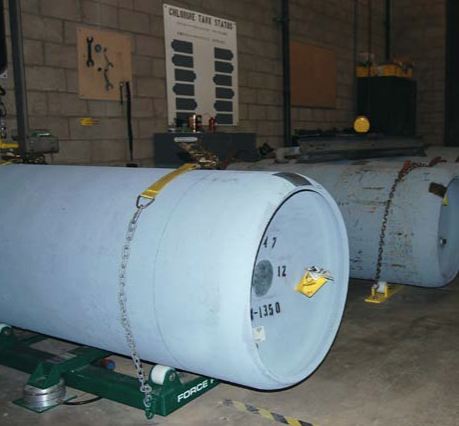 Mass flow provided an additional advantage of allowing a simple, direct means of reconciling monthly throughput compared against the change in weight of the chlorine gas containers that were installed on load cell technology scales. After consulting with the application engineering team at Fluid Components International (FCI), the engineers at the water department selected the Model ST100L thermal dispersion gas mass flow meter with built-in Vortab® flow conditioner (Figure 2). 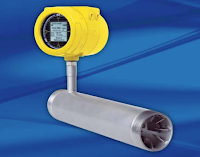 The Model ST100L is an in-line, spool piece flow meter that combines best-in-class transmitter/electronics and superior sensor design to provide a truly state-of-the-art gas flow meter for industrial process and plant applications in line sizes up to 2 inches [50 mm]. FCI’s model ST100L constant power technology thermal flow meter (Figure 3) was installed in the water system’s chlorine gas inlet line to the chlorinator panel. To ensure maximum corrosion resistance and longest service life in the highly corrosive chlorine gas environment, the ST100L’s entire sensor assembly, including flow elements, flow body and Vortab flow conditioner elements, are fabricated entirely of Hastelloy C-276. 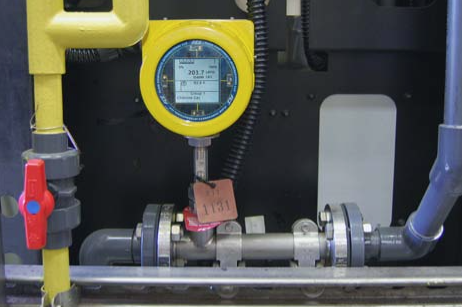 FCI’s gas flow meters are typically calibrated in FCI’s NIST traceable flow laboratory using the actual gas to be measured and at the installation’s actual temperature and pressure conditions. However, chlorine gas presents safety concerns during the calibration process which renders that process unfeasible. It has also been thoroughly established that air equivalency calibrations for chlorine gas are inaccurate, unrepeatable and simply, inadequate. FCI solves this problem by combining a lab-based equivalency basic calibration with an on-site, in-situ calibration adjustment against the site’s rotameters, all performed by an FCI field service technician. This achieved the highly accurate and repeatable measurement needed by the client. The on-site calibration matching proved to be the best solution because the totalized flow readings from the FCI Model ST100L and the weigh scale comparison were now consistently aligned. The in-line configuration ST100L meter measures air/gas ow from 0.25 SFPS to 1000 SFPS (0,07 NMPS to 305 NMPS), with turndowns of 100:1 and with accuracy of ± 0.75 percent of reading, ± 0.5 percent of full scale. To match present and future DCS, PLC or SCADA needs, users can select from multiple output options including triple 4-20 mA analog, frequency/pulse, or certified digital bus communications of HART®, FoundationTM Fieldbus, PROFIBUS PA and Modbus RS485. The ST100L flow meter also features a best-in- class graphical, multivariable, backlit LCD readout, which provides operators with a continuous display of all process measurements, alarm status and service diagnostics. Its four-button user keyboard is activated through the glass, which means the user never needs to remove lids or open up the unit at the installation site. The instrument also includes a USB port for PC interface and an ethernet port for service needs. The ST100L meter is designed to ensure the longest service life in even the most rugged industrial applications and installations. The enclosure is NEMA4X/IP67 rated and features four separate conduit ports to isolate all wiring. Additional pedigrees include global agency approval for hazardous environments (ATEX, IECEx, FM, FMc, Inmetro, NEPSI and EAC/TR CU) and SIL compliance. The electronics/ transmitter is available for installation as either integral with the flow element or remotable (up to 1000 feet [300 meters]). The integral Vortab flow conditioner ensured optimal installation performance by overcoming the limited piping straight run and the flow range occurring in the transitional flow region. Vortab uniquely eliminates both swirl and velocity profile distortions produced by process equipment obstructions and/or inadequate straight run of pipe and ducting, as well as temperature and media stratification that can be present at the low flow rates where FCI meters perform and with the lowest pressure drop of all flow conditioner alternatives. The ST100L ow meters have been installed in the chlorine gas inlet lines and achieving consistent accurate and repeatable ow measurement results. The site is achieving the desired disinfection results with proper chlorine dosing at significant cost savings due to reduced chlorine use, avoiding re-treatment and lessened residual chlorine removal processes. FCI (Fluid Components) offers the widest selection of thermal dispersion technology instrumentation products. When rugged conditions combine with strict process control requirements, FCI’s thermal dispersion RTD sensing elements establish an unmatched record of superior product performance and reliability for the harshest environments. For more information on FCI in Maryland and Virginia visit http://www.flowtechonline.com or call 410-666-3200. 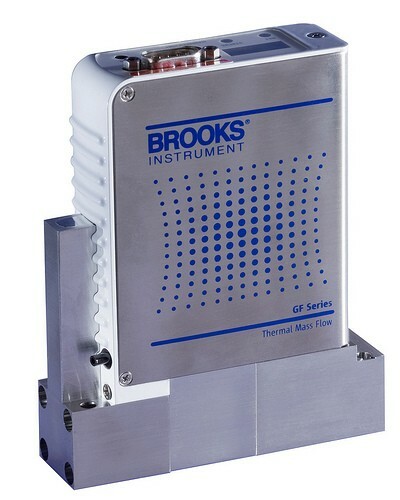 Brooks Instrument manufactures mass flow controllers with a well earned reputation for accuracy and reliability. LabVIEW™’s integrated development environment for building measurement and control systems is used in laboratory, university, and pilot manufacturing plants around the world. Together, Brooks MFCs and LabVIEW make a great combination for measuring and controlling mass flow, as well as for for data acquisition. Below are some typical communications scenarios used between Brooks MFCs and the LabVIEW™control platform. require highly efficient pump operation. Written by Jim DeLee, Sr. Member Technical Staff, Fluid Components, Inc. Reprinted with permission. The old saying, “an ounce of prevention is worth a pound of care” may have been coined by process and plant engineers tired of repairing or replacing pumps. Pumps are often the most under serviced pieces of equipment in process automation when it comes to maintenance and prevention best practices. Unfortunately, nothing moves without the humble pump and a process becomes inefficient when they don’t operate properly or completely shutdown. Many times the pump manufacturer is seen to be the problem, when in fact the process or the surrounding equipment configuration is the cause. Engineers and technicians looking to optimizing their process for productive operation can start with the pump, and protecting the pump against common hazards. Pump protection improves end- product or batch quality, reduces material costs, eliminates waste and lowers maintenance costs. Taking good care of your pump delivers a positive payback. Here are some simple strategies that can be employed—starting with an analysis of process media ow rates. Today’s highly competitive global market finds demanding process industries such as petrochemicals (Figure 1), food/ beverage, pharmaceutical, and water/waste treatment among others, transforming their plants into 24/7 lean operations. The result is that the pumps in most plants are running near capacity to keep up with material through-put objectives and demand. One of the most common hazards to efficient pump operation is irregular material flow, which can result in three negative conditions: (1) ow turbulence, (2) low flows, or (3) dry running conditions. A key process protection step taken by facilities and plant engineers is controlling material flow to ensure that pumps operate efficiently. This results in moving stock or product with the least possible expenditure of energy and at the same time reducing maintenance requirements and extending the life of the pump. Failing to control material flow effectively can lead to some unwanted conditions, such as cavitation, pump bearing failure, or seal failure. The first problem — cavitation — can reduce through-put, or even cause quality problems. Losing a bearing or a seal can lead to pump shut-down, possibly process line shut-down and the unfavorable conditions could get worse the further you take this type of scenario. The first step in protecting your process and pump starts with analyzing the flow. You want to analyze the flow to ensure the media is owing regularly at the pressure required by the pump with a minimum headloss. Any number of process conditions can cause irregular flow, such as turbulence, temperature changes, unwanted air ingestion, etc. The problems of irregular flows and turbulence, in particular, can be especially challenging to solve because eliminating the root causes are often difficult to impossible—so you need a workaround strategy. The chief culprit when it comes to damaged pumps is the build-up of heat from low ow or dry running conditions, which occur when liquid ow dramatically slows down or stops owing altogether through the line or the pump. When the liquid isn’t there to provide cooling, the heat can destroy a pump’s bearings or seals. If repair is even possible, it is going to be a very expensive due to repair or replacement costs and down time. Pumps require a stable upstream ow profile in the pipeline before liquid enters the pump for proper and efficient operation. Irregular flows often result in cavitation, a condition where cavities form in the liquid at the point of pump suction. One often cited industry pump installation guideline suggests at least 10 diameters of unobstructed pipe be placed between the point of pump suction and the first elbow or other disturbance. Obstructions and/or corrosion in a pipe can change the velocity and flow profile of the media and affect its pressure as well. 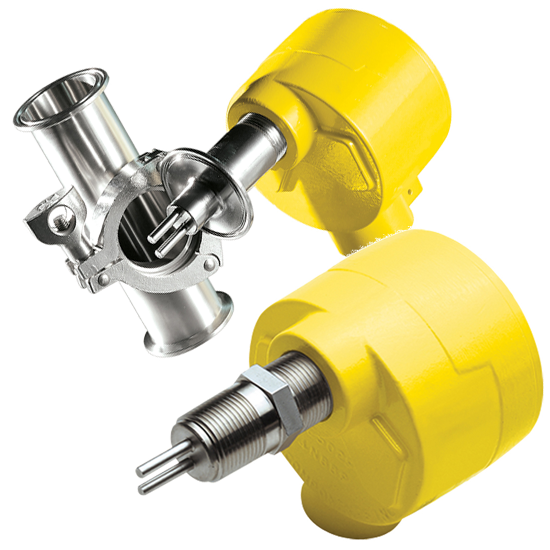 In most cases, plant real estate limitations result in the placement of elbows, valves or other equipment that are too close to a pump, and these devices can create swirl and velocity profile distortion in the pipeline (as well as pressure changes). Such disturbances can result in excess noise and cavitation, resulting in reduced bearing and/or seal life. A good solution to ensure an optimal flow profile for efficient operation is to install an inline or elbow ow conditioner upstream from your pump. Isolating the effects of velocity profile distortions, turbulence, swirl and other ow anomalies in your pipeline will result in a repeatable, symmetric, and swirl-free velocity profile with minimal pressure loss. 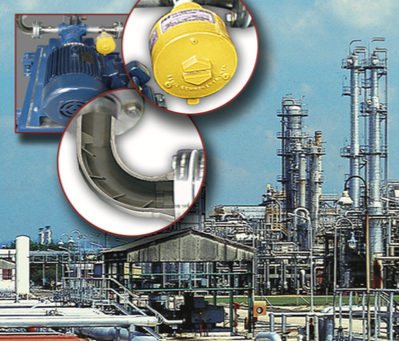 To increase a pump’s life, start with a more stable operating environment. A conditioned ow stream enters the pump’s impeller in a uniform and equally distributed pattern, optimizing pump ef ciency and extending bearing life while at the same time decreasing noise and cavitation. If there is no choice other than to deal with less than ideal piping configurations, an inline or elbow ow conditioner will eliminate all upstream straight run requirements for pumps, compressors, flow meters and other critical process equipment (Figure 2). Tab type ow conditioners, such as the Vortab® Flow Conditioner, have proved successful in these applications. Other flow conditioning technology choices, including tube bundles, honeycombs, and perforated plates, may also be considered depending upon the pressure drop limitations. The inline or elbow ow conditioner’s profile conditioning tabs produce rapid cross-stream mixing, forcing higher velocity regions to mix with lower velocity regions. The shape of the resultant velocity profile is “ at” and repeatable regardless of the close-coupled upstream flow disturbances. Incorporating anti-swirl mechanisms into the design of the flow conditioner eliminates the swirl condition typically seen exiting 90-degree elbows. The result is a ow stream that enters the pump in such a way that it maximizes the efficiency of its operation and reduces stress. In addition, the tapered design of the anti-swirl and profile conditioning tabs make them immune to fouling or clogging. Avoiding the damage that is caused by a low ow or a dry running condition can be achieved by installing a point flow switch in the process loop. Dual relay flow switches will detect not only a low flow condition, but also alarm on a dry condition too. This capability allows the control system or operator to take corrective measures before the bearings of the pumps are overheated and fail. Many types of point flow switches are available. For example, the FCI FlexSwitch® FLT Series, with its no moving parts design, offers a highly robust scheme for pump protection with its dual alarm capability (Figure 3). With Alarm 1, the switch will detect a low-flow situation anywhere between 0.01 and 3 feet per second (FPS) (.003 to.9 meters per second MPS). This low flow alarm can be regarded as a pre-warning signal for the control system or operator. Alarm 2 can be set at a no-flow condition. The system or operator can then decide to keep the pump running or to shut it down. 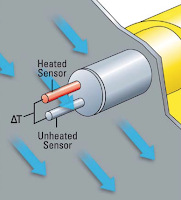 This dual-function flow switch indicates both flow and temperature, and/or level sensing in a single device. It can be specified in either insertion or in-line styles for large pipe or small line applications. This single switch monitors your direct variable of interest, flow, and temperature simultaneously with excellent accuracy and reliability. Each of these technologies has their advantages/ disadvantages, depending on the media and your application’s requirements. Some may be the only choice in certain media for your application. By looking at these factors, as well as your plant’s layout, environmental conditions, maintenance schedules, energy cost and ROI, you will quickly be able to narrow the field to one or two best choices. When designing new plants or retro fitting old ones, be sure to consider pump requirements. Optimizing your process with your pumps in mind offers a wide range of benefits: higher capacity, improved quality, lower energy costs, reduced maintenance, and increased equipment (pump) life. Consider inserting a flow conditioner to eliminate turbulent ow problems. One of the most common pump problems is irregular flows caused by turbulence that frequently results when the minimum pipe straight runs required between the point of pump suction and elbows, valves or other equipment are either ignored or pushed to the limits. Inserting a flow conditioner frequently eliminates turbulent flow problems. Another key safeguard is to protect your pump from accidental low flow or dry running conditions, which can lead to bearing or seal loss requiring expense repairs. Inserting a dual alarm flow switch in your process loop not only protects the pump from damage, but will alert you to a potential problem and let you be proactive in evaluating the necessity of pump shut down.